I finally got to make some with my daughter's design on them and and they are SO adorable! She gave them to her employees as part of her "goodbye" gifts, since she is being transferred. I've been mulling over ideas for what else I could do with these cuties for a while now. I love magnets, but there are only so many you can have/give to others and I LOVE this idea and want to do LOTS of it! 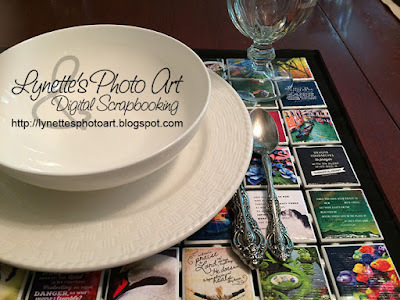 The basic idea is the cool 3D look of 2"x2” tiles with miniature “Instagram” pictures on them, and frost that off with getting to save and enjoy your most favorite images on things that are actually useful, not out of sight in a book or drawer! I came up with a few ideas and made mock ups in PhotoShop to see how they would look. I do this to be sure I will like the final results when a project will either cost more than just a little or will take a lot of time and effort, just to be sure before I start. I started with a photo of my table and then graphically added the tile pieces with black backing and turned the color of my placemats black too. I do not own the images on the tiles in these mock ups. I used many of my fav Instagram images for these mockups, so I could get a genuine idea of how it would look. No copyright infringement is intended, only compliments! These projects have not been made yet, just mock ups. Ok, the disclaimer handled, now for the fun stuff! 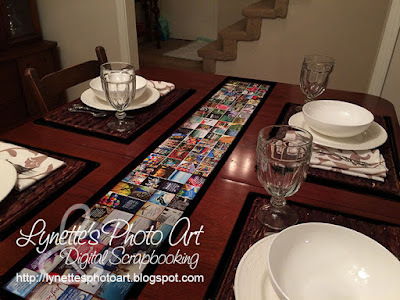 My first original and exciting idea was to make a table runner of them. If a few are pretty, more is better, right??? 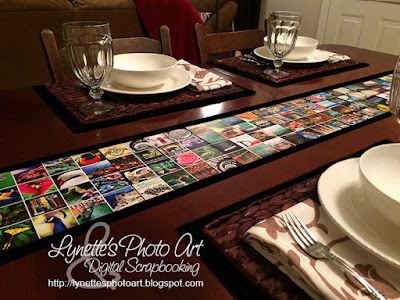 I love the idea of a "hot pad" the entire length of the table, how awesome is that?? I love the look and it would be SO handy without the utilitarian look of a trivet! I'd have a 12" plain black drop at both ends. 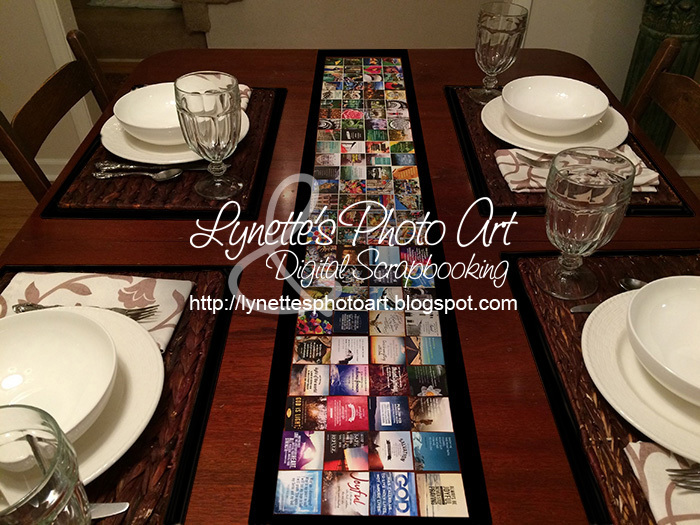 The fabric runner underneath not only protects the tabletop, but frames the images perfectly! The tiles wouldn't need to be attached to the fabric, which would make storage much easier, the fabric washable and the runner/placemats usable for other tablescapes as well. Who has room for lots of one-use-things? The tiles come with 36 2" squares attached in a square. 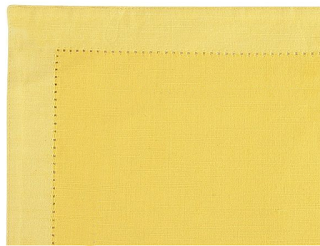 Their weight is enough to hold them in place on the fabric runner and are a good size to stack easily for storage. I'd use plain black placemats and napkins at the place settings to go with it and plain white dishes. The need for a heat proof sealant is problematic, though I'm sure it's solvable. 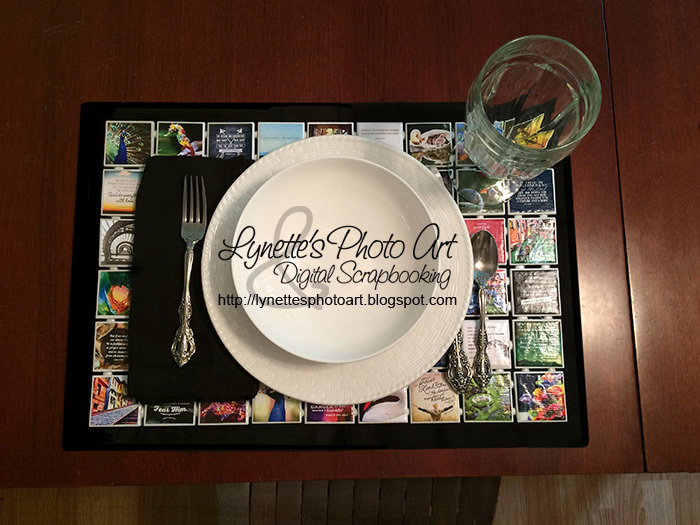 Scale that idea down and I got placemats! They are no thicker than many chargers I've seen, or the woven hyacinth ones I have (in the mock ups above, from Home Goods). I love it! Just as cool as the runner, but smaller and wouldn't have to be heat proof! One could use just the square of tiles (36 tiles) as it comes for a square charger, and could sit them on black square placemats. I'm not a square placemat girl. I want enough room to put everything right on my placemat and charger! It just so happens that one and a half sheets of tiles, laid together perfectly fit standard rectangular Hemstitched placemats! By pushing them together, you can't tell the last 3 rows aren't attached to the big square. 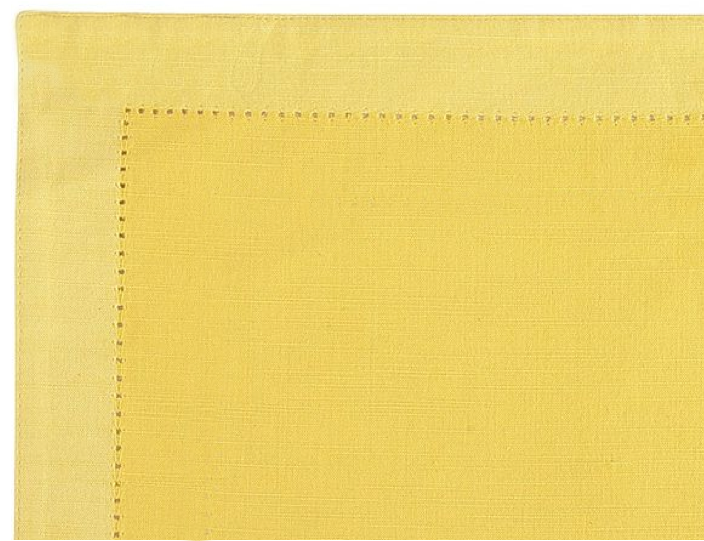 Example of the Hemstitched placemat. Sweeeeet!! I don't know about you, but I'm over the moon about this! I just adore this!!! So in love with this! 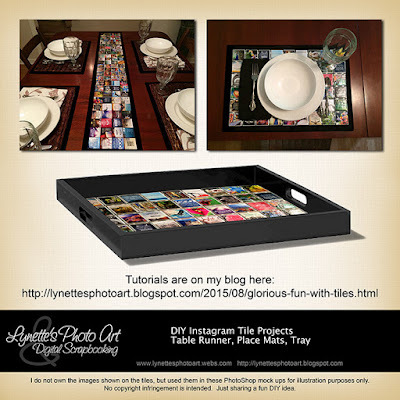 Another project I thought of using these precious little tiles is a serving tray! I can't wait to make one of these too!!!! LOVE IT!!! For the magnets I made, I went to Lowes and Home Depot shopping the tiles. Lowes had some I really liked. They were much thinner than many and the edges are roughly beveled, but they aren't white. They're way too much off white. Home Depot had white, but they were thick, heavy and a whopping $10 per sheet compared to Lowe's $3 per sheet. For the Instagram effect, I needed the edges to be white. Just for the record, acrylic craft paint won't work. I bought a can of Rustoleum primer and paint in one and sprayed them white. Once cured, they are perfect! The substance they are connected with cuts easily with a razor knife. I found that a bit of it stays on the tiles. Just a little more attention with the knife removed the residue. What tore up using my fingers went on perfectly with the cloth! Let it dry, then add a layer of glossy ModPodge over the top to seal it. Frankly I plan to buy a can of glossy spray sealant for paper and try it next time. I already had the ModPodge, but the texture it leaves is not ideal for my liking on this project. Once this dried thoroughly, I used the wonderful, marvelous E-6000 cement from Hobby Lobby to attach the magnets to the backs. Thanks to Michael's 40% off coupon, 52 magnets were $5.88 including tax. Let the cement cure and they are ready to move to their new "homes", beautifying whatever you have that's metal! I can't wait to make the placemats and tray! I mean I REALLY can't wait! I'm in the process of going through my image files and choosing my favorites to use. SO MANY YEARS OF PICTURES!!!!! Ahhhhh! A big job for a perfectionist, but a blessing too with so many wonderful memories as I go through them. I'm also going to use scripture inspirations throughout the project too which will make them so much more uplifting and awesome! There's nothing like being reminded of God's Word, His Holiness, His righteousness, His goodness and faithfulness toward His children to lift your spirits and really make your day! I hope you enjoyed this and maybe got inspired to make some for yourself! I'm thinking CHRISTMAS GIFTS too! You could make a project from someone's Instagram account and give them to them as a gift! I've got to think they'd love it as they loved their images enough to post for the world to see. UPDATE: I have now made three trays for Christmas gifts and have a tip to help in case you try them. When I finally found trays that would work with the 2" increments I needed, I ended up needing more than one solid sheet of tiles. This creates an issue of the additional rows of tiles not always aligning perfectly to the main sheet of tile, if I just laid them in the tray as planned. The easiest solution is to cement the tiles to the tray with E-6000. However, I wanted the tiles to be removable in case someone wanted to use just the tray alone = no permanent installation. 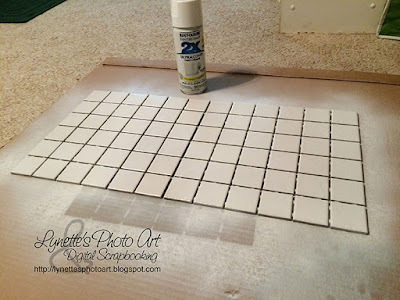 I know I could caulk/grout the tiles together and then lay them in the trays as a solid unit, but I LOVE the 3D look and even the little spacer connectors. Just LOVE it and don't want to do anything to loose that 3D. I was sad when I tiled my kitchen backsplash and the dimension disappeared when I grouted. Not again!!! :) I adore the 3D of these little tiles! I am putting the tiles in black trays, so whatever I did needed to be black, and veeeery thin as the handle openings just accommodate the tiles. I had some black screening left from re-screening my back door. Perfect! First I got rid of any little tags of the stuff they stick the tiles together with (to regulate their spacing). Then I laid them on their face on foil (to protect my surface). I ran a bead of E-6000 around all the outer edges, then a dot in every tile's corners. I carefully laid the black screen scrap over them, pressing them into the cement. Then I did the same for the loose rows, putting some cement on the connecting spots too. I pressed the screen down being sure the loose rows were snug and lined up perfectly. Now there is an "invisible", strong common backing for all the tiles. They can be handled as one sheet and will always line up perfectly. Their new owners will be able to remove them for any reason, as well as change out the images on them by ModPodging new ones over the top. Yeah! They are all so cute! I can't wait to see people's responses!